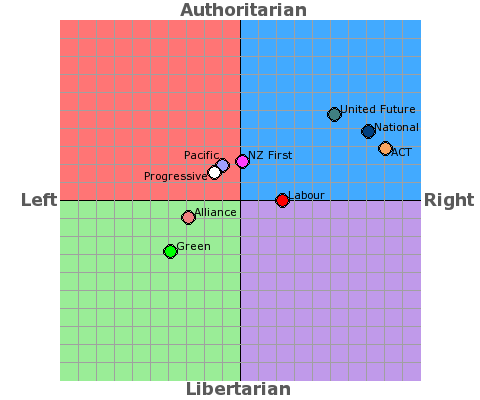 I’ve retested myself on the Political Compass – I’m in similar position to last time. This similar to where I was last time, and very close to the world and the New Zealand averages which doesn’t surprise me. I’ve tried to give honest and accurate responses but it’s not perfect. It’s more of a theoretical measure that doesn’t take into account local conditions and whether you support pragmatic politics (I do) or are more of a stickler for ideology. I definitely don’t share NZ Green Party political ideals despite being closest to them on the compass. I share some environmental ideals but not their socialist interventionist proposals. Perhaps I have similar ideals but different ideas on how to achieve those ideals. 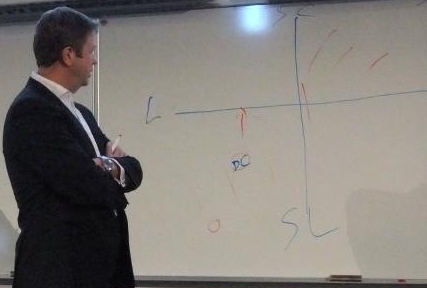 In interesting part of last week’s Vote Chat last week was when Cunliffe was asked to indicate where he thought his political leanings where on a chart that shows Left-Right on the x axis and Libertarian-Authoritarian on the y axis. DC is the spot he marked for himself. That’s interesting, I have done a test on this for myself at Political Compass and was placed quite close to the same position – although I have to say it would have been a little to the right. Is Cunliffe in the wrong party! Or maybe we just get too obsessed with labels and alignments. I suspect Labour has since been dragged somewhat from their 2008 position, but it’s hard to know where to. Going back to the Cunliffe chart – he was also asked where he thought Labour was positioned – he indicated all of the bottom left quadrant – and where National was positioned – he indicated the whole of the top right quandrant. That’s very odd, as if they are complete opposites with no overlap. Goff’s done laps around the whole course. The current National government has been called Labour-Lite. Both major parties have been called Tweedledum and Tweedledee. I think it’s simply an example of where a politician can be captured in a fake world of perceived ideological polarities. In reality most of us have much more in common than we have differences. I might be close to David Cunliffe on one theoretical chart but I feel quite different to him as far as priorities and approach to politics and current issues goes.